During this tour, taste foods from all over Japan and experience traveling across the nation in only 3.5 hours! Take a peek into the history and culture of Japan through various unique flavors, regional souvenirs and hands-on activities. This tour includes stops at ten different cuisine-related shops inside the COREDO Muromachi shopping complex in the historical Nihonbashi district. Then, you will move on to experience Rolled Sushi Making with an English-speaking instructor. Meet at the Nihonbashi Information Center at 11:15am then go on a tour across Japan from North to South in just 60 minutes! 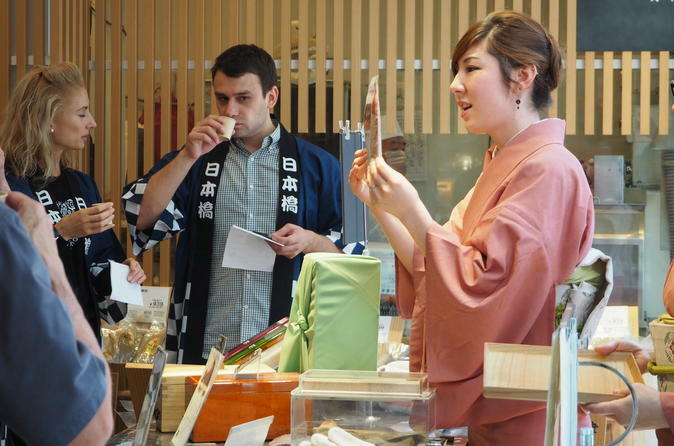 Your English-speaking guide (wearing a traditional kimono) will take you to many different cuisine-related shops inside the COREDO Muromachi shopping complex in the historical Nihonbashi district. During the tour, you may learn about different kelp products, try some samples, learn all about gold leaf and the variety of ways it’s used in Japan, find out how to search for the perfect sized chopsticks for your hand and try a chopsticks game, and more! After the 60 minute walking tour, you'll head over to the gourmet cooking studio at one of Asia’s largest culinary schools, boasting more than 150 studios throughout the region. Following the instruction of an experienced cooking teacher, you’ll learn to prepare Rolled Sushi and some more Japanese cuisine while learning many techniques to take back home! Finish your experience having lunch and with a sampling of 5 different Shochus (Japanese National alcohol) of various ingredients such as rice, barley, brown sugar, sweet potato and mango. Shochu is different than “Sake" as it is distilled while sake (called Nihonshu in Japan) is a brewed rice. You can enjoy Shochu not only on the rocks or straight, just like whiskey, but also with soda and juice which is called Sour Coktail.